Measuring Down? | Lord...What's My Motivation? I guess some things CAN be measured. Let me restate that. Some things SHOULD be measured. I have been thinking a lot about my students this week. It’s been a busy week. (And I forgot to tell you last week about my middle school student who, during group work, tapped me on my shoulder. I turned round. He was wearing a paper mustache and goatee. Cooly, he stated in a dark Guatemalan accent, “I don’t drink often. But when I do…I prefer Dos Equis.” I almost wet myself. It was the funniest thing I’ve seen in months.) Anyway…I digress. My students are literally the highlight of my day, and the most concerning part of my approach TO my day. Let me explain. 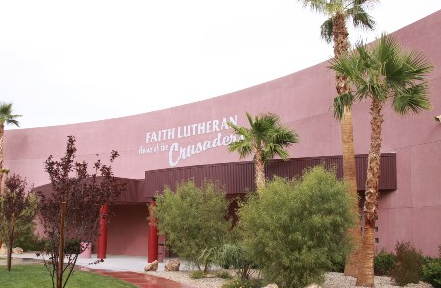 Faith Lutheran High School (the best school in the country) is a caring, nurturing supportive, and safe exception to any student’s Middle School / High School career. I love it there. I find myself spending hours nit-picking little tiny things to complain about daily…simply because it is such an amazing place to be. Isn’t that funny? I kick myself daily, saying “I’m too blessed to be stressed.” At the ends of my days (good days and bad)…I walk to my Nissan Cube, and I find myself worried about my students. Why should I worry about these kids, who are in our care, behind decorative gates and stone walls, sharing the good word of Jesus Christ? I’m proud of my students. I have faith in my students. I’m scared for my students. I think sometimes…we don’t allow our students to fail. There is an onset expectation when you purchase something, and that is, you’re going to GET what you paid for. If you grab a Sierra Mist, you know you’re getting ice cold, citrusy goodness. If you purchase a new car, it darn well better fill you nostrils with new car smell. If you purchase a Happy Meal, gosh darn it, there had better be a toy in there! You GET what you pay for. I think there should be NO EXCEPTION with that mind-set when you enroll a student in a private school for a quality education. It’s part of my philosophy as I approach my classroom everyday. I’m fulfilling my end of that expectation. Is this a reasonable expectation when we’re dealing with impressionable young people? People with personal goals, dreams, fears….and unique dynamics? I wonder. Every time I post a cast list, and one of my students allows the ensemble role that they thought would be a principle role alter their self-control…and they begin bad-mouthing a fellow student…I break down inside a little. Every time I witness the rules bend ever so slightly for a student so that they may be allowed to play a sport, or participate in an event….because that parent called the administration, and maybe, just maybe, this is the “least disruptive solution”….I question my approach to these kids, a little. Every time I see a student cut in the lunch line…get caught…and then don’t react with remorse…I feel a little lost. “Wow, Erik. There are teachers in some schools walking the same halls where drug deals are being made, and your dissecting a situation regarding cutting in the lunch line?? Dang, you wussy.” Well…in my defense, this is all I know. I feel very badly for third world countries where people go to sleep starving every day. I will pray for them. But, I cannot fully understand that world, or affectively “deal” with it either…because this is the only world I know. So, in the sterile lunch lines of Faith Lutheran…yeah, these things affect me. What are we doing to our students? Teaching them. Right. But what? Reading, Writing and Arithmetic? What about winning AND losing? Right AND wrong? Good AND bad? They surely know WHAT these things are….but do they know HOW these things are? We do not affectively prepare our students for the real world, if we don’t ALLOW THEM to fail sometimes. Students are going to mess up…get a C- on their AP English homework…forget to turn an assignment in….get a detention for necking in the hallway…smoke a cigarette. All students mess up…they are all TEMPTED to compromise the free will and self-control that is gifted to them by God. It’s not the messing up that is important….it’s WHAT THEY DO AFTERWARDS that will surely define their characters, and generate exceptional, private school students…and even better, lay the ground-work for brilliant young Christian leaders after high school. I sat four young men down after a middle school class this week. They were talking out of turn, disrupting the presentations of their classmates, snapping rubber bands and playing on their cell phones. All within 10 minutes. (I told you we had multi-tasking, talented kids at Faith.) I pulled them aside and said “look…I don’t want to give you a detention. YOU don’t want me to give you a detention. I need you to be respectful in class. If not, the school’s rules state that you must receive a punishment, which in turn makes me the bad guy…which in turn makes you unhappy with me, which makes me sad. So…here’s the deal. I’ll give you your phone back. The rubber bands I’m keeping…because, frankly, I’m out of rubber bands….but we’ll start fresh next class, with a clearer understanding of my expectations. If then, we continue to have problems…. detention. Understood?” Three of the four kids apologized. I accepted it….and waited. The fourth got a detention today. He continued down the same path. I asked him to stay after class…and then I asked him to fill out the detention form. He did it sharply and quickly…and accepted it. I think that was VERY good. I’ll tell you something. The process of MAKING good cookies is always the same. Mix the proper ingrediants…bake them for a certain time…allow them to cool. We can measure what NEEDS to go into each cookie, very carefully. But, what happens if we make an error? 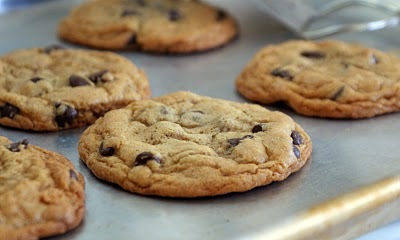 I don’t blame the process of making cookies…and I certainly don’t stop making cookies altogether. Instead, I learn from my mistakes, restart and try again. I learn. Hopefully, I’ll wind up with better cookies. If we (teachers and parents) take time with our students…nurture their needs as individuals (as we all know that God made each of these little ones by hand…there were no cookie cutters up in heaven)….and then be a part of the clean up process when they fail (continuing to nurture)…then maybe we’ll wind up with a batch of really well-prepared cookies. And who doesn’t appreciate a well-prepared cookie? This entry was posted on September 21, 2011 at 4:27 am and is filed under FAITH, FAMILY and FUN, THE HIGH SCHOOL THEATRE CLASSROOM with tags chocolate chip cookies, cookie cutters, cookies, fail, failure, Faith Lutheran, faith lutheran high school, measuring, Students, success, teachers. You can follow any responses to this entry through the RSS 2.0 feed. You can leave a response, or trackback from your own site. Love it! Every single day I thank him for the OPPORTUNITY to have my daughter go to Faith and experience teachers, people, and mentors such as yourself! Thank you Mellow for allowing us the privledge! stumbleupon on a daily basis. It’s always exciting to read through articles from other writers and practice something from other web sites.